If your domain name is not resolving or you’re having other weird issues with errors appearing instead of web pages, check to see that your DNS records are set correctly. 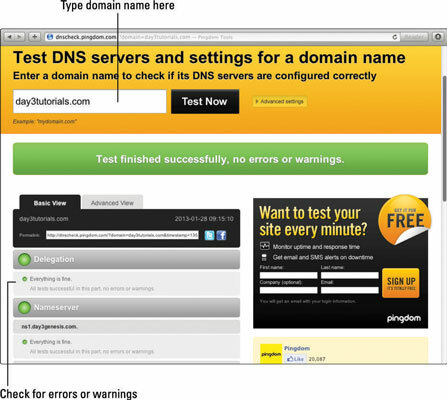 The simple and easy way to do that is to go to dnscheck.pingdom.com, put your domain name into the box at the top of the page, and click Test Now. If you need a second opinion, you can go to intodns.com, type your domain name into the box, and click Report. Both sites check on your DNS configuration and report on any errors they find. This helps you know what the problem is. While it may not be immediately apparent how to resolve the issue, identifying the problem provides a good place to begin looking for the solution.